KUWAIT: The interior ministry called on residents whose visit visas have expired to settle their residency issues and leave the country to avoid legal measures. The security information department of the ministry said in a press statement that this procedure prevents expatriates from being subjected to restrictions on the renewal of their residencies. It said violators will be prosecuted. 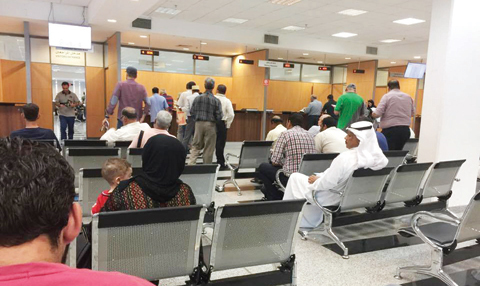 Meanwhile, a report in Al-Anbaa daily said latest statistics by the residency affairs department about the number of expats who have valid residency permits show there are 2,861,380 such expats – 2,017,084 males and 844,296 females. The statistics by the Residency Affairs Department, headed by Maj Gen Abdullah Al-Hajeri, showed that the number of workers who have article 17 residency permits (who work in the government sector) is 107,887 – 68,577 males and 39,350 females. As for those who work in the private sector, their number is 1,518,711 – 1,394,913 males and 123,798 females. The number of domestic helpers who have article 20 visas is 687,267 – 349,273 males and 337,994 females. Those who have family visas number 544,048 persons – 202,295 males and 341,753 female, and those who are self-sponsored (with article 24 residency permits) number 2,429 – 1,191 males and 1,238 females. A security source estimated residency violators at more than 90,000, adding that the interior ministry is considering several options to reduce their numbers, adding one of the options is to carry out intensive campaigns to arrest them and take action against their sponsors, especially those who entered on visit visas and did not leave. The source expressed hope that citizens and expats will participate by not harboring these people. He said studies are being made to take action against those who harbor residency violators.